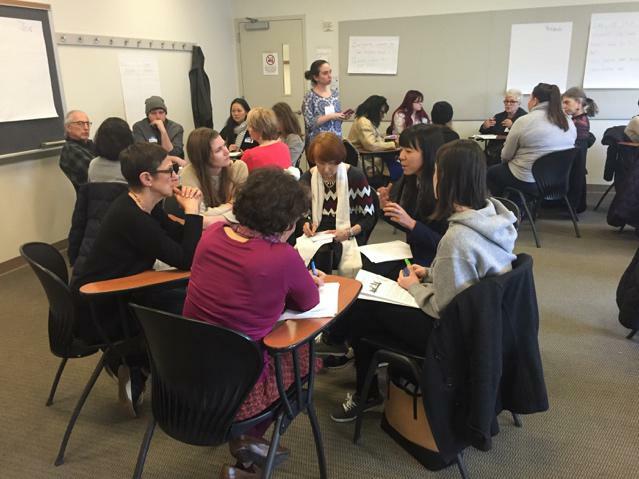 On Monday, March 28, 2016, The Radical Age Movement was invited to demonstrate our Inter-generational Age Café in collaboration with student members of the Aging Caucus at Columbia’s Social Work School. Although we ran this program before, this was the first time we were assured that we would be working with a truly inter-generational group of people. Forty people participated in the demonstration, 20 young adults and 20 older adults. 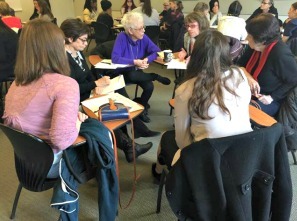 The workshop was co facilitated by Alice Fisher, 70, Founder of The Radical Age Movement, and Angela Hu, 29, a second year Columbia social work student. The Age Café is based on a model of engaging people in conversations that matter called the “World Café.” The World Café is a powerful social technology offering an effective antidote to the fast-paced fragmentation and lack of connection in today’s world. Based on the understanding that conversation is the core process that drives personal, business, and organizational life, the World Café is more than a method, a process, or technique – it’s a way of thinking and being together sourced in a philosophy of conversational leadership. The World Café methodology is a simple, effective, and flexible format for hosting large group dialogue. The process usually begins with the first of three or more twenty minute rounds of conversation for small groups. At the end of the twenty minutes, each member of the group moves to a different new group, while the group facilitator remains the host of the original circle, welcomes the next group and briefly fills them in on what happened in the previous round. Our challenge was to figure out how to exercise this process, which is usually at least 3 or 4 hours long, within the 90 minute framework allotted by Columbia. Although an extremely short amount of time, we could not pass up the opportunity to bring the different generations together. Because of the time restrictions we formulated only 2 questions to be addressed during this workshop. #1 was “When you think of ageing, what feelings do these thoughts provoke, and what are your fears?” #2 was “What can we do as a society to ameliorate the rise in age discrimination?” Participants were given two rounds to discuss question #1 and one round to discuss question #2. 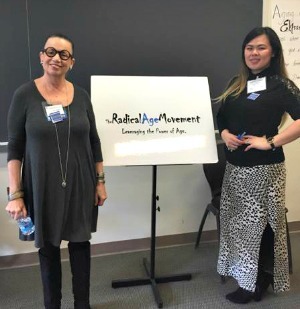 Members of Radical Age’s steering committee served as group facilitators. What is the significance of holding inter-generational programs like this? Many of the younger and older participants were separated by two generations. The concerns of many of the students who are about to enter the world to pursue their careers are very different from those of us who were in the same position 50 years ago. Meanwhile, those of us who are entering our older years are also experiencing a different environment than our parents did when they made the decision to retire and enjoy their “golden years.” What this tells us is that there is no longer a blueprint to guide either cohort on their life’s journey. It is up to all of us, young and old, to create a new blueprint for the generations to follow. Each group cannot do this alone. Only together can they travel this unexplored territory and learn from each other along the way. One fact that was evident is that both cohorts are greatly affected by the current economic climate. Younger participants expressed their worry about finding a job and leading an independent life, while realizing that they may have go back to the nest and live with mom and dad until they can accomplish what was for us olders a given. The jobs were waiting for us. We were exceeding our parents’ accomplishments without much concern that this would not happen. We also did not enter the adult world bogged down with the outrageous school loans that these students are chained to. Our older conversants were also concerned about the economy. Many feel that they will not have the financial resources to care for themselves. Age discrimination has forced many out of the job market. Longevity and advances in medical technology has created a new and vital cohort along the life span; and, yet, this cohort (people between 60 and 80) remains for the most part invisible. Conversations about our youth obsessed culture were plentiful, as were conversations about education, healthcare, and the workplace. Encouraged by the positive feedback from everyone involved, we are going to do it again! We are now planning a full Inter-generational Age Café for June. We will be sharing the sponsorship of the event with The Transition Network and other interested organizations. We are excited about the opportunity to share this enlightening experience with you. If you are on our mailing list, you will receive save-the-dates and fliers about the event. If you are not on our mailing list, please contact us to join.